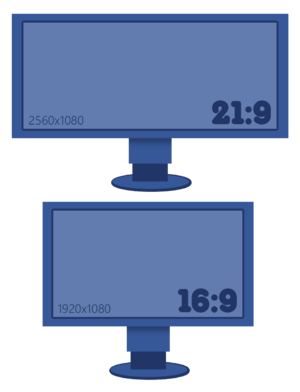 Size comparison between an ultra-widescreen (21:9) monitor and a standard widescreen (16:9) monitor. For a list of games, see games with ultra-widescreen support. Ultra-widescreen is a term that refers to widescreen resolutions with an aspect ratio roughly wider than 2:1, and often marketed as "21:9". The term is most commonly applied to a 2.37:1 (64:27; ex. 2560x1080) aspect ratio, but refers also to nearby aspect ratios such as 2.4:1 (ex. 1920x800) and 2.13:1 (ex. 1920x900); in contrast to the more widely supported 1.78:1 (16:9; ex. 1920x1080). Provided a game does not properly support ultra-widescreen resolutions, it can often still be played at a pillarboxed 16:9 or 4:3 resolution on most ultra-widescreen monitors. This may involve using GPU scaling to prevent stretching to fit the screen, and in some cases using a custom resolution. The most commonly used ultra-widescreen resolution is 2560x1080. Multi-monitor support often makes a game compatible with ultrawide monitors. Allows to see more of the game world at once. Removes letterboxing from the top and bottom of the screen while watching cutscenes in certain games. Crysis 3 displays in the 21:9 aspect ratio, but its UI is centred and obstructs the player's view. Many games, especially older or lower budget titles, either do not support ultrawide resolutions, or zoom in (using Vert-) or stretch a 4:3 or 16:9 image to fit or fill the screen instead of giving a true ultrawide image, adversely affecting the gaming experience. Available community solutions to implement Hor+ ultrawide support often involve file modifications and memory hacking. The WSGF have recently introduced a new set of medals relating to a game's support for the ultra-widescreen 21:9 aspect ratio. Similarly, the site also contains information on how to force individual games to support the ratio. This information has now been implemented into the PCGamingWiki video settings table. The vast majority of games have yet to be rated by the WSGF for their ultra-widescreen support. For games that give a zoomed in (Vert-) image, if FOV is adjustable it can be adjusted to compensate and give a proper Hor+ true ultrawide image. The FOV calculator can be used to calculate the proper FOV increase to achieve a proper 1:1 Hor+ image (in general, when going from a 16:9 to 21:9 image, a horizontal FOV increase of 17 will convert a Vert- image to a proper Hor+ image). Unlike Vert- games, if the game simply stretches a non-ultrawide image, FOV can be adjusted to create a wider image and approximate Hor+ but the proportions will still be somewhat off. PCGamingWiki uses icons in the video settings table to illustrate the level of ultra-widescreen support awarded to a game by the WSGF. Equivalent to an A-grade from the WSGF. The game has received a perfect score from the WSGF for its UW support, and is 'Ultra-Widescreen Certified'. Equivalent to a B-grade from the WSGF. The game is without major flaws in its UW support, but has at least one blemish that prevents a perfect score. Equivalent to a C-grade from the WSGF. The game has some level of UW support but has significant practical issues. Equivalent to an unsupported grade from the WSGF. The game may be unplayable in UW, or the image may be stretched to fit the window. Equivalent to an incomplete or unknown grade from the WSGF. Analysis of the game's UW support has not yet been completed. This page was last edited on 17 January 2019, at 12:04.